I have very good reasons for my lack of posts this past month. The main one being that my husband had a 12 day stay at the hospital 2 days after we moved into our new house. He spent 5 days in the I.C.U. and an additional 7 days in the general hospital fighting a frightening strep A infection. This is the same strain of infection that can lead to things like the flesh eating disease and rhematic fever. Several people haved died from it already this year. I have a new respect for single moms. It’s been stressful trying to finish off a move, take care of very sick husband and do the day to day things needed for my girls. 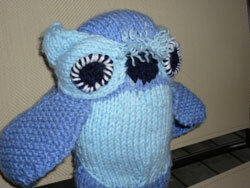 It hasn’t stopped me from knitting though. Knitting has helped keep me sane. 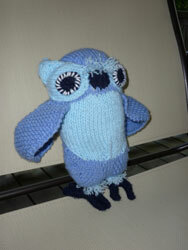 Here’s little A’s finished owl. 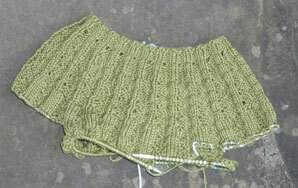 And my new project is a lovely short sleeved top for me. This is from Creative Knits – Spring issue. Sorry no link. I can’t find anything but their most current issue. You’ll just have to wait until it’s done to see what it looks like.